Core Sample Removal Tools There are 2 products. Core Sample Removal Tool for 2" Core Tubes 48" Long. 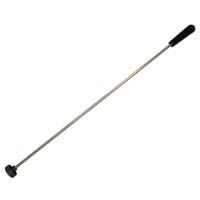 Our core sample removal tool is stainless steel with a hard plastic knob on one end for a sure grip. The 44 mm (1-3/4” diameter) plunger on the other pushes the sample. 48 inches long, other sizes available. Core Sample Removal Tool for 2" Core Tubes up to 36" Long. Our core sample removal tool is stainless steel with a hard plastic knob on one end for a sure grip. The 44 mm (1-3/4” diameter) plunger on the other pushes the sample. 30 inches long, other sizes available.